1Since Mathew Brady did not actually take photographs himself, he was rejected as a photographer by art historian Beaumont Newhall; however, since the 1970s, he has regained the place that should have always been his by rights. Philip Kunhardt now considers him to be the first magazine photographer; Richard Rudisill acknowledges his gift for having established a link between the daguerreotype and American culture; and Barbara McCandless regards him as the inventor of celebrity culture, the ancestor of our modern paparazzi (Panzer 5). 2But how can we account for his unbelievable success and his sad end? “Mr Lincoln’s camera man,” as Arthur M. Schlesinger called him in the New York Times in 1946, was a shrewd businessman. Thanks to a medal he had obtained at the 1851 London Great Exhibition, he built up a substantial list of useful contacts, people who knew they had to control their image to preserve their aura with an audience. By the same token, he bought studios in strategic places (e.g. in New York near Union Square and in Washington in the business district between the White House and the Capitol), calling them National Portrait Gallery, using the same name as the famous gallery in London. 3What was Brady’s connection to power? What kind of an observer was he? We will try to answer these questions by setting side-by-side two portraits of Lincoln and two of Brady’s self-portraits. Mathew Brady, The Lincoln Cooper Union Portrait, 27 Feb. 1860. Library of Congress, Prints and Photographs Division, Washington, D.C.
4The Cooper Union Portrait of February 1860 is very much in keeping with the national role Lincoln aspired to. The elements of the setting are reduced to a bare minimum: a column, symbolizing democratic institutions (the studio would always have scenery columns), and two books, possibly suggesting the Bible and the Constitution, in any case a solid education. The background is neutral, without curtain or painted decor. Lincoln places his hand on the two volumes in a casual pose, suggesting learning but also a gentle mastery. His features are distinct and his eyes, staring at us, contrast with the poses used at the time, that is, people looking away. 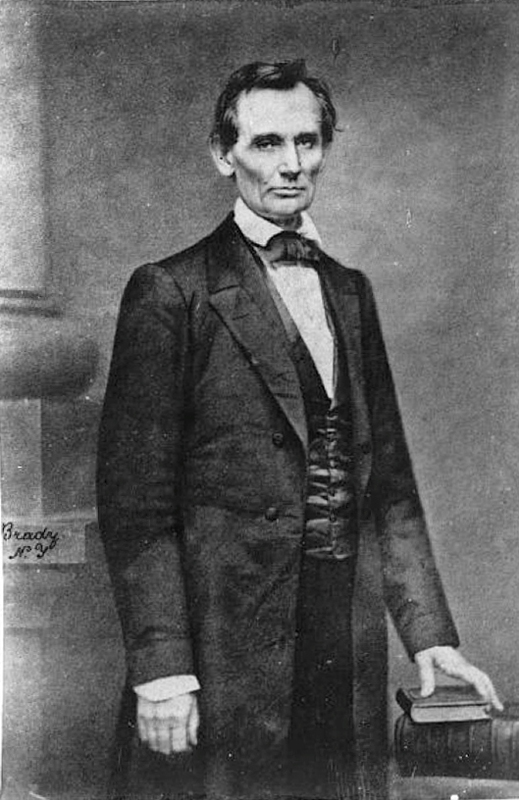 5Lincoln wears a three-piece suit with the collar of his white shirt turned up by a bow tie so as to hide the unusual length of his neck. The three quarter pose is harmoniously placed in the center of the picture. The hand, the seat of a man’s commitment, and the head, the seat of a man’s soul, are harmoniously aligned in a confident pose that invites the elector to trust Lincoln’s abilities. Last but not least, Brady put his signature on the column to the right of the future president’s hand. This discrete gesture reveals his desire for photography (and the photographer) to be given due respect and significance (even if he doesn’t yet recognize photography as an art). 6With the gestures reduced to a minimum, the almost empty decor, the subject’s straightforward posture, and the total absence of extraneous elements—all of which combine to convey an aura of mystery—it represents an almost full-length portrait of a U.S. presidential candidate that has served as a model for future presidents (like, for instance, Barack Obama). It is thus easy to understand why Gail Hamilton preferred the photographs taken by Brady to the portrait painted by Alexander Healy: “The sun is a faithful biographer and no respecter of persons. He gives us men as he saw them, shining down on their faces at noonday” (Panzer 84). 7The portrait was printed on postcards, often embellished with a landscape (thanks to the technique of wooden engraving) and served as a cover for Harper’s Weekly, Frank Leslie’s Weekly, and Currier & Ives’ lithographs that illustrated the Cooper Union speech. The elaborate setting; the obvious visibility; the use of different media such as buttons, newspapers, postcards, and headed notepaper, were all instrumental in getting Lincoln elected to the White House. As he modestly acknowledged: “Brady and the Cooper Union speech made me president” (Meredith 68). In other words, the image Brady created showed Lincoln to be perfectly in harmony with the character and style of the nation’s highest office. 8This portrait—which, thanks to its closeness, allows us to distinguish Lincoln’s features—was replaced on February 21, 1861, at the time of the inauguration, by a portrait signed by Alexander Gardner who was one of Brady’s photographers working in his studio at the time. If “Brady gave his models a public identity” as Panzer said (47)—and this was the case with Lincoln Cooper Union portrait—Gardner’s portrait of Lincoln, on the contrary, shows a picture of a worried suffering conscience. Let us see how. 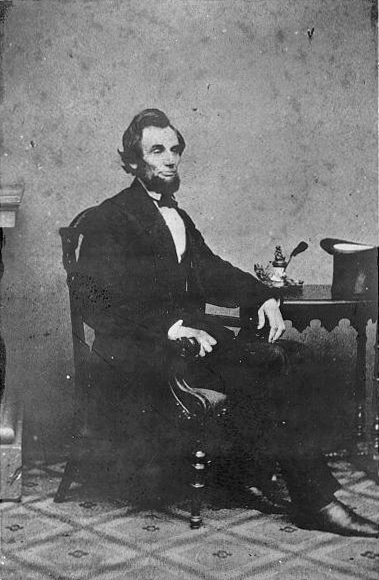 Alexander Gardner, Full length portrait of Lincoln seated next to a small table, 24 Feb. 1861. Library of Congress, Prints and Photographs Division. Washington, D.C.
9In this portrait, we find no column, no books, no signature. On the table, we discover an upside down top hat, an inkpot, and its quills but no paper. The clean-shaven face of 1860 is now hidden under a bushy beard, and the confident stare has retreated under drooping eyelids. The hands are idle. With the top hat, its blank look, and lifeless body in a sitting position, this composition is an inversion of the preceding one: the sense of commitment and mastery has vanished altogether. The pedestal and the table are cut in half, just like the country. The diamond-printed flooring—pointing towards the sitting president—gives an impression of aggressiveness, and the empty space between Lincoln and the camera creates an atmosphere of solitude. With his eyes closed, Lincoln’s American heroism is now limited to his faculty of feeling the pulse of the country’s tension. Gardner was sensitive enough to register Lincoln’s vigilance. Brady’s “serene, comprehensive, pitiless” point-of-view, described by Schlesinger in the New York Times, has now been replaced by Gardner’s deep empathy with his model’s torments. Remember: This photo was taken in late February, the war started in April. 10Brady, a man with a mission for whom the camera was “the eye of history,” transformed his New York gallery into a press agency. In his window, he showed a picture taken by Gardner entitled, “The Dead at Antietam,” so New Yorkers could see the real nature of this war. “He has brought home to us the terrible reality and earnestness of war. If he has not brought bodies and laid them in our dooryards and along streets, he has done something very like it,” wrote The New York Times. Panzer explains his choice to work at the front by his need to make a fresh start. The field of operations offered a new arena for investigation, an open setting opposed to the confined atmosphere of the studios. The columns and the tables were now trees, tents, posts; and photographers were in close contact with high-ranking officers. But taking a photograph on glass plates and bringing them to the studio was a real challenge: “No one will ever know what I lived through to secure those negatives,” he said. “The world can never appreciate it. It changed the whole course of my life” (Newhall 91). 11Let’s turn to the self-portrait taken by Brady in 1861 after his return from the battle of Bull Run, a heavy defeat for Lincoln’s army—of which no photo remains (Panzer 10). Although Brady’s portrait is sometimes accompanied by the mention “photographer unknown,” Alan Trachtenberg calls it a self-portrait. Brady is standing full length with his hands in his pockets and his right leg forward as if he were about to move. When the war was declared, he said: “I had to go. A spirit in my feet said go and I went” (Rosenheim 64). This position shows that he is no longer content with being a studio photographer but instead has to be where the action is. The profile shot is emblematic of his modus operandi as a discreet but keen observer on the field of action. As in a mute dialogue, the left profile of Brady mirrors Lincoln’s right profile. He is held spellbound by what he is staring at. 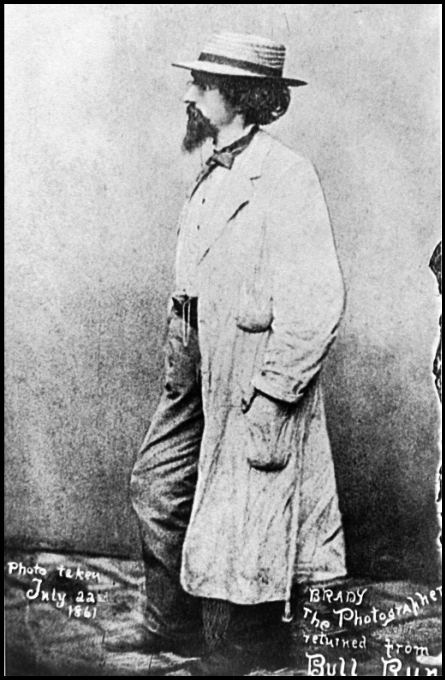 Mathew Brady, The Photographer, returned from Bull Run, 22 July 1861. Library of Congress, Prints and Photographs Division, Washington, D.C.
12Both the boater hat—the emblem of the profession since Bayard’s self-portrait (1839)—and the trench coat with its multiple pockets, which was to become the traditional jacket of reporters, are in keeping with his mission. By leaving it unbuttoned, his frailty and receptiveness are underscored. The chain of his fob watch and the bow tie remind us that, despite the American Civil War, Brady has preserved a certain distance that could be interpreted as politeness. His existence as a photographer certainly depended on his capacity to keep in touch with influential people. By this mixture of discretion, watchfulness, motion, receptiveness, and elegance, Brady introduced to his field a new figure which will give birth to a new icon: that of the war reporter. 13But any foundation implies a site and a limit. Thus, at the bottom of the picture, in simple handwriting with carefully drawn capital letters, elements of temporality and localization reinforce the sense of human fragility: “Photo taken July 22, 1861, Brady, The Photographer returned from Bull Run.” These elements with their journalistic accuracy as well as their euphemistic and metaphoric reference to the Bull Run massacre, are like an epitaph, as if Brady had run away from the kingdom of the dead to bear witness. And this is exactly what happened: He wandered for many days and in total confusion among dying soldiers before he could find his way back. Through this confrontation with the emptiness of this no man’s land, the photographer fills the void of the spatio-temporal framework of Bull Run, and because he remains at the “degree zero of narration” (Seymour Chatman) through these metaphoric references, his self-portrait can emerge as an iconic representation. 15A second lateral self-portrait is the one showing Brady and the staff of a Union general. The photographer provides a visual equivalent of Tocqueville’s ‘democratic leveling’ by placing the men on the same horizontal line. Brady here stands apart from the military group. He still wears his boater and holds the shutter release. The general has set up his camp in the forest, with two tents visible in the background. The tree against which Brady is leaning is now the visual marker that separates him from the generals. It signals a break between the sphere of action, embodied by the soldiers on the left, and that of its potential representation by the lone individual standing on the side line (Marin 144). On the one hand, the undifferentiated uniforms, swords, and gestures reduced to their symbolic function are signifiers which in French critic Jacques Derrida’s words “are the object of their own repetition, of their own image or resemblance” (138–39); on the other hand, the boater and the shutter release undercut the reality effect created on the left and gives the picture access to the world of the signified. Mathew Brady: Major General R. B. Potter and Staff, between 1861 and 1865. Library of Congress, Prints and Photographs Division, Washington, D.C.
16The verticality of the swords pointing towards the ground, suggestive of death and punctuating the left part of the photograph at the same time, is paralleled on the right by the string of the shutter release, symbolizing the link with the spectator. Instead of looking away, as in the Bull Run self-portrait, Brady now has become a full-fledged photo reporter. The tents and the trees in the background have become the new visual markers of his peregrinatio, his wandering. His leaning against the tree shows that contact with nature is essential. It is this Kairos, which Brady has chosen to visually signify the foundation of his non-enlisted corps, the corps not of soldiers but of war reporters. Belonging to that corps requires them to be where the action is—that is, on the same horizontal egalitarian line as the men—while at the same time able to distance themselves from them so as to produce a story in pictures. By this choice of presence, Brady has access to an immobile time allowing him to create the corps of reporters. 17In sum, it is difficult not to overestimate the contribution to photography by a man who was half blind. Yet, his pictures supported photography’s road to independence, which eventually guaranteed it a key role in the field of politics. Contrary to Barthes’s “ça a été” (“This has been”), these pictures announced the future. Among those who followed in Brady’s footsteps were Albert Londres, Capa, the reporters of Magnum and Vu who continued the work he had initiated as “sentries of the people” (“sentinelles du peuple”), to use La Rochefoucauld’s phrase, thus contributing to the visibility of public debate. Brady’s idiosyncrasies, his life experience, his creation of the reporter’s trade, left its mark on Lincoln’s visual image in Europe just as his studio contributed most of the visual references that were subsequently presented to the European public. Arasse, Daniel. Le Sujet dans le tableau. Paris: Champ Flammarion, 1997. Print. “Brady’s Photographs: Pictures of the Dead at Antietam.” New York Times 20 Oct. 1862. Nytimes.com. Web. 16 Feb. 2016. Derrida, Jacques. De la grammatologie. Paris: Minuit, 1967. Print. Holzer, Harold, Gabor Boritt, and Mark Neely Jr. The Lincoln Image: Abraham Lincoln and the Popular Print. 1984. 1st ed. New York: Scribner Press, 1984; Champaign: U of Illinois P, 2005. Print. McCandless, Barbara. The Portrait Studio and the Celebrity: Promoting the Art. New York: Abrams, 1991. Print. Marin, Louis. L’écriture de soi. Paris: PUF, 1999. Print. Newhall, Beaumont. History of Photography. New York: Museum of Modern Art, 1982. Print. Melville, Herman. Battle-Pieces and Aspects of the War. New York: Harper & Brothers, 1866. Gutenberg.net. 19 May 2004. Web. 18 Jan. 2016. Meredith, Roy. Mr. Lincoln’s Camera Man: Mathew B. Brady. New York: Dover, 1974. Print. Panzer, Mary. 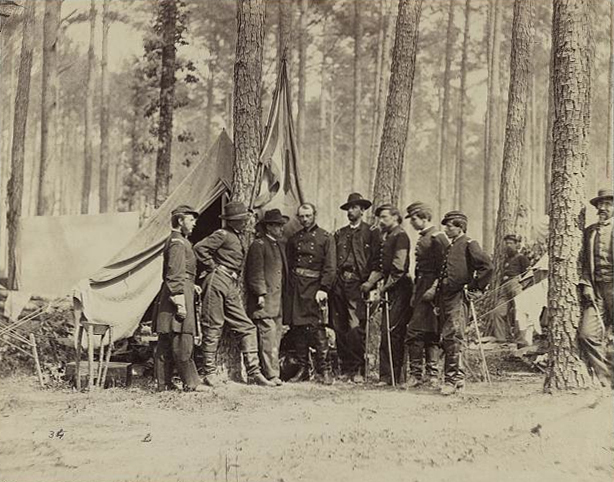 Mathew Brady and the Image of History. Washington, DC: Smithsonian Institution, 1997. Print. Pritzer, Barry. Mathew Brady. North Dighton, MA: World Publications, 2004. Print. Ricœur, Paul. Temps et récit. Paris: Seuil, 1983–1984. Print. Rosenheim, Jeff L. Photography and the American Civil War. New Haven, CT: Yale UP, 2013. Print. Rudisill, Richard. Mirror Image: The Influence of Daguerreotype on American Society. Albuquerque: U of New Mexico P, 1971. Print. Sontag, Susan. Regarding the Pain of Others. New York: Farrar, Strauss & Giroux, 2003. Print. Trachtenberg, Alan. Reading American Photographs, Images as History: From Mathew Brady to Walker Evans. New York: Hill and Wang, 1989. Print. Marie Cordié Levy holds a Ph.D. in the History of Photography from Paris-Diderot university. She specializes in the study of self-portraits, and has published Autoportraits de photographes, Paris: Acte Sud, 2009, and L’autoportrait photographique américain, 1839–1939, Paris: Mare & Martin, 2014. Cordié Levy, Marie. “Matthew Brady’s Abraham Lincoln.” American Studies Journal 60 (2016). Web. 24 Apr. 2019. DOI 10.18422/60-07.